Hoist the black sails and prepare to plunder! You are in luck today, landlubber, because you are on the verge of joining the most elite group of scoundrels and pirates this world has seen! The name of their ship alone is enough to make sailors quiver in their boots, and for empires to curse their names. Some foolish men would call them arrogant, but they are a cut above the rest, sea-faring thieves without equal, who will live by their own rules or die trying. So, join their crew if you dare, and bask in the riches of your new life-style, for as long as it lasts. 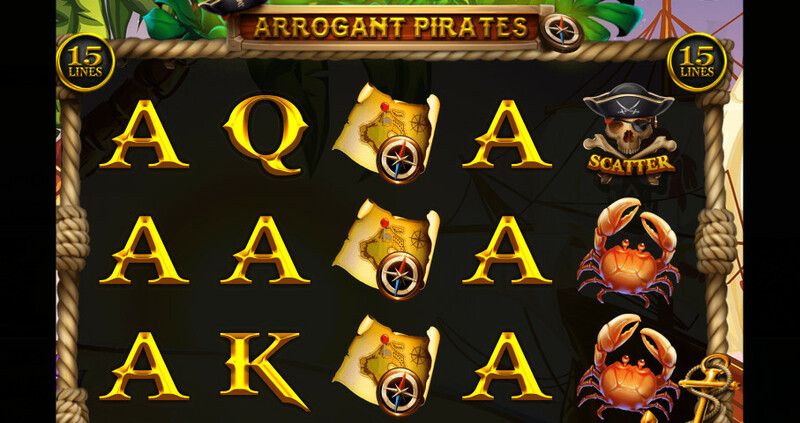 Arrogant Pirates is a video slot that builds on this theme of pirates to a certain degree. The music is certainly on-point, helping to sell the feeling of being a pirate, as does the background image, that depicts the warm, tropical island on which the large ship has beached itself on, and where our arrogant cast have come to bury their treasure. Symbols are a mixed bag, and there are not many interesting animations for us to really look at and admire. We were not able to find any information on the volatility of this game. 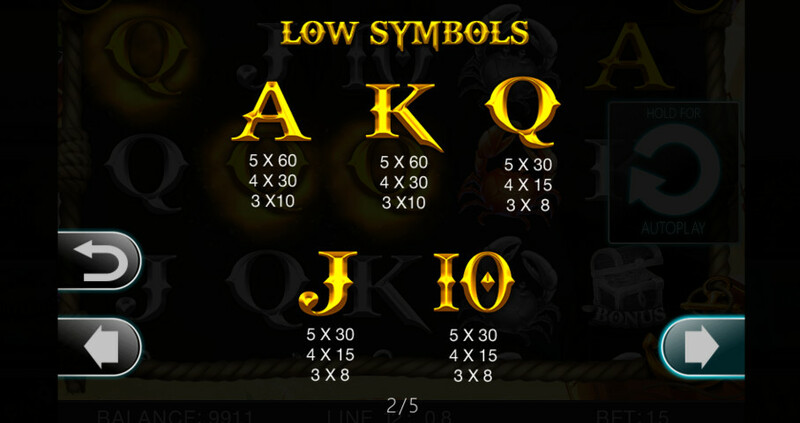 Arrogant Pirates is played on a 5×3 playing field with 15 fixed paylines, which means gamblers cannot turn some or all paylines off in order to lower the minimum bet. We were also not able to find any information on this title’s RTP, so we cannot tell you what sort of returns you can expect. By adjusting your bet per line, you are able to set your wager between $0.15 up to $150 per spin. By holding down the spin button, players will be able to activate the Autoplay feature. However, it has no additional settings. Instead, it will continue spinning until you end the auto spins early, or you run out of cash, whichever comes first. 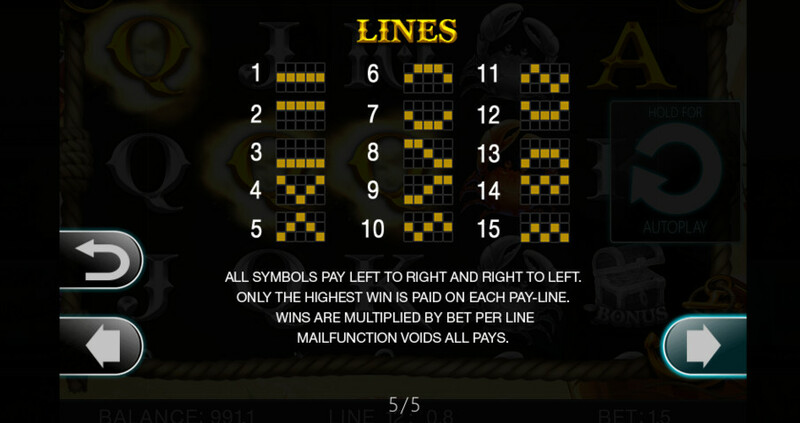 Payouts for all symbols are awarded by collecting three or more identical icons both left to right and right to left following one of the fifteen active paylines. The symbols are a mixed bag. There are plenty of playing card royals, like 10, J, Q, K and A, that are the lowest paying icons. 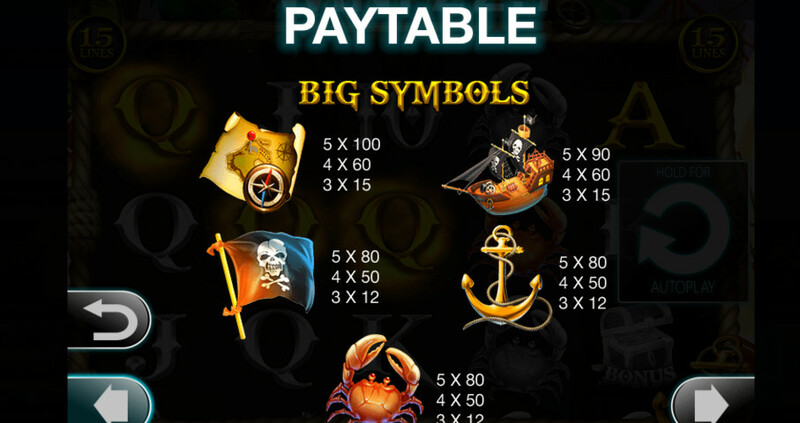 There are also completely unique symbols, including the crab, a golden anchor, a pirate flag, a ship with pirate sails, and a map leading to this island, that is the highest paying icon. Special symbols include bombs which act as Wilds, a skull with crossed bones and a pirate hat as a Scatter, and a treasure chest as a bonus icon. When a Wild appears on the playing field, it can award a multiplier worth 2x, 5x or 10x, which is only in effect for the winning line the Wild is a part of. 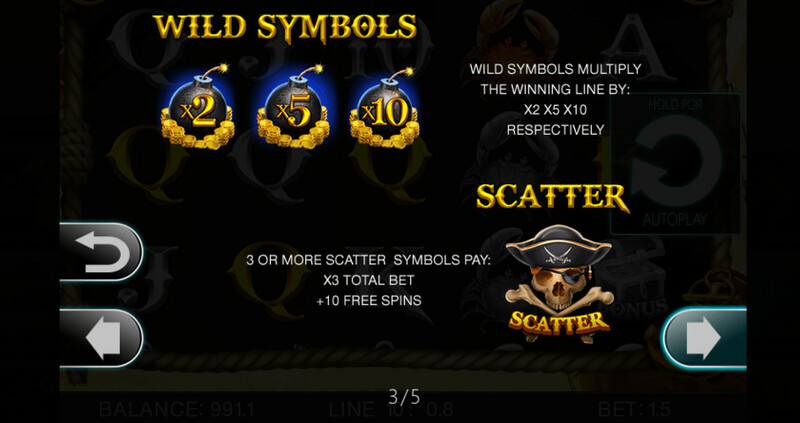 Collecting three or more Scatters, and you get a minor cash prize win, as well as ten free spins. Finally, collecting three bonus symbols activates the Bonus round. 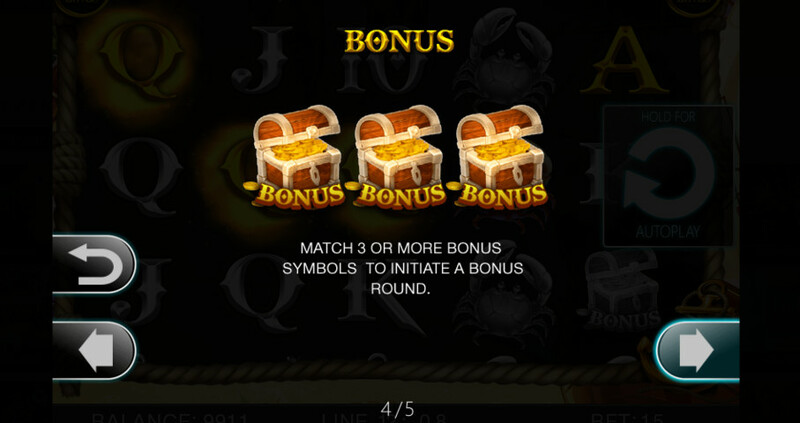 During said bonus round, gamblers will pick between those same three chests, and win the cash prize hidden within.